Our mission is to promote and protect the human rights of all Alaskans including immigrants, refugees and Alaska Native communities by providing critical services to these underserved populations, including legal representation, language interpretative services, training and educational programs. Founded in 2005, the Alaska Institute for Justice is the only agency in Alaska dedicated to protecting the human rights of immigrants and refugees. 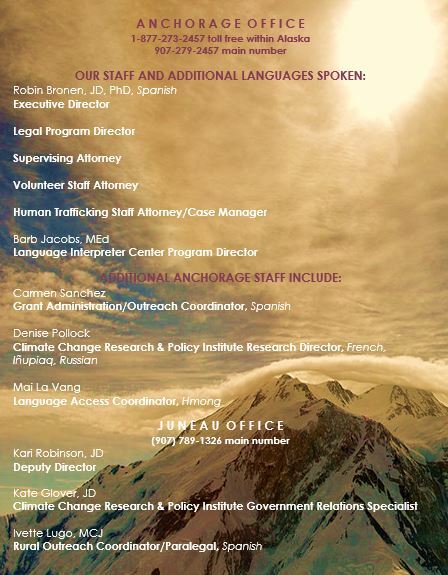 Based in Anchorage and Juneau, our staff provides statewide comprehensive immigration legal services, as well as language interpretation and translation services throughout Alaska. Collectively, AIJ Board and Staff have more than 25 years of legal experience serving Alaska’s immigrants and refugees. AIJ staff provides services statewide, traveling to many communities throughout Alaska including, Unalaska, Sitka, Ketchikan, Kodiak, Juneau, Fairbanks, Kenai and Homer. AIJ’s legal service priorities include representing immigrant crime victims and people fleeing persecution and torture in their home countries. Our staff also assists human trafficking victims and Alaskan families seeking to reunite with family members residing outside of the United States. In addition to providing quality direct legal services, AIJ staff members serve as a critical resource for state and federal public agencies on issues involving immigrants and refugees. Health care providers, social service providers, state officials, criminal defense attorneys, prosecutors and judges are just a few of the professionals in our state who rely on the expertise of the AIJ staff. In 2007, AIJ opened the first statewide Language Interpreter Center (LIC). The LIC partners the public and private sector to offer statewide training for interpreters as well as provide referral services for all businesses and agencies in need of interpreter services. The LIC is working with foreign language interpreters as well as Alaska Native interpreters.